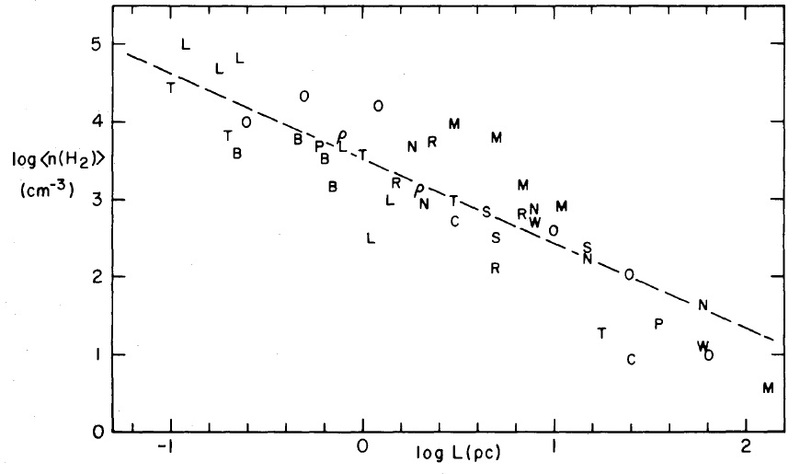 Data for many molecular clouds and condensations show that the internal velocity dispersion of each region is well correlated with its size and mass, and these correlations are approximately of power-law form. The dependence of velocity dispersion on region size is similar to the Kolmogorov law for subsonic turbulence, suggesting that the observed motions are all part of a common hierarchy of interstellar turbulent motions. The regions studied are mostly gravitationally bound and in approximate virial equilibrium. However, they cannot have formed by simple gravitational collapse, and it appears likely that molecular clouds and their substructures have been created at least partly by processes of supersonic hydrodynamics. 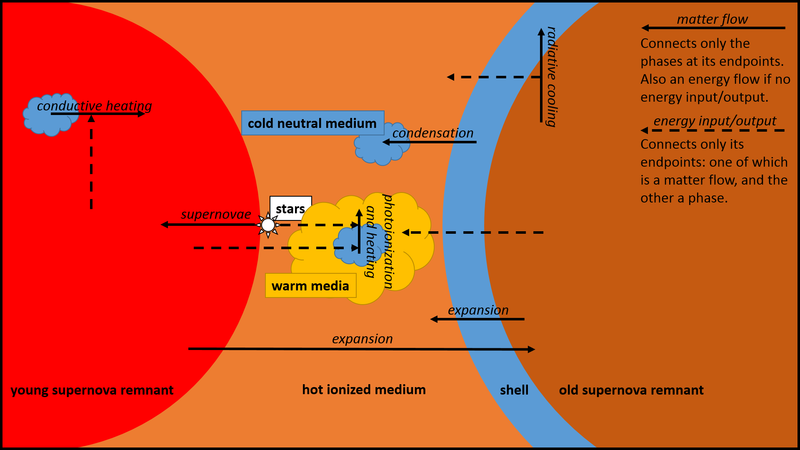 The hierarchy of subcondensations may terminate with objects so small that their internal motions are no longer supersonic; this predicts a minimum protostellar mass of the order of a few tenths of a solar mass. Massive ‘protostellar’ clumps always have supersonic internal motions and will therefore develop complex internal structures, probably leading to the formation of many pre-stellar condensation nuclei that grow by accretion to produce the final stellar mass spectrum. Molecular clouds must be transient structures, and are probably dispersed after not much more than yr.
How do stars form in the ISM? The simple theoretical picture of Jeans collapse — that a large diffuse uniform cloud starts to collapse and fragments into a hierarchy of successively smaller condensations as the density rises and the Jeans mass decreases — is NOT consistent with observations. 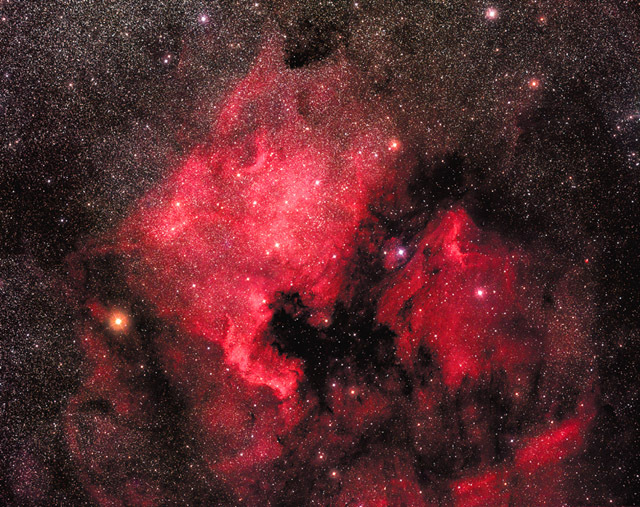 Firstly, astronomers see complex structure in molecular clouds: filaments, cores, condensations, and structures suggestive of hydrodynamical processes and turbulent flows. In addition, the data presented in this paper shows that the observed linewidths of regions in molecular clouds are far from thermal. The observed line widths suggest that ISM is supersonically turbulent on all but the smallest scales. The ISM stages an interplay between self-gravity, turbulent (non-thermal) pressure, and feedback from stars (with the fourth component, thermal pressure, not being dominant on most scales). Larson proposes that protostellar cores are created by supersonic turbulent compression, which causes density fluctuations, and gravity becomes dominant in only the densest (and typically subsonic) parts, making them unstable to collapse. Larson uses internal velocity dispersion measurements of regions in molecular clouds from the literature to support his claim. Such power-law forms are typical of turbulent velocity distributions. More detailed studies today find , suggesting compressible, supersonic Burger’s turbulence. meaning the regions are roughly in self-gravitational equilibrium. which means that the column density is nearly independent of size, indicative of 1D shock-compression processes which preserve column densities. Note These three laws are not independent. They are algebraically linked: that is, any one law can be derived from the other two. The three laws are consistent. Larson digs through papers that investigate optically thin line emissions such as CO to determine the variations in and , and consequently calculate the three-dimensional velocity dispersion σ due to all motions present (as indicated by the dispersions and ) in the cloud region (assuming isotropic velocity distributions). Both and are needed to obtain the three-dimensional velocity dispersion for a length-scale because the region has both local velocity dispersion and variation in bulk velocity across the region. The two dispersions add in quadrature: . 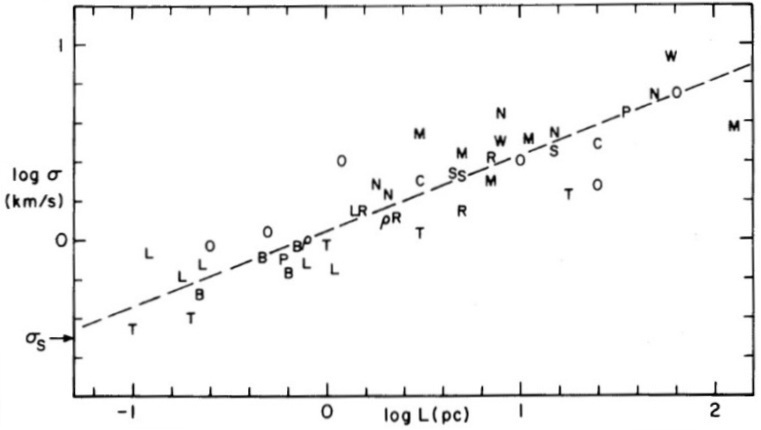 To estimate the mass, Larson assumes that the ratio of the column density of CO to the column density of is and that comprises 70% of the total mass. Note that for a molecular cloud with temperature 10 K the thermal velocity dispersion is only 0.32 km/s, while the observed velocity dispersions , are much larger, typically 0.5-5 km/s. which is similar to the power-law for subsonic Kolmogorov turbulence. Note, however, that the motion in the molecular clouds are mostly supersonic. A characteristic trait of turbulence is that there is no preferred length scale, hence the power-law. Possible subdominant effects modifying the velocity dispersion include stellar winds, supernova explosions, and expansion of HII regions, which may explain some of the scatter in Figure 1. Figure 2. Most regions are near virial equilibrium ( ). The large scatter is mostly due to uncertainties in the estimates of physical parameters. Most regions are near virial equilibrium. The scatter in the figure may be large, but expected due to the simplifying assumptions about geometric factors in the virial equilibrium equation. If the turbulent motions dissipate in a region, causing it to contract, and the region is still in approximate virial equilibrium, then should decrease and should increase, which should cause some of the intrinsic scatter in Figure 1 (the – relation). A few observed regions do have unusually high velocity dispersions in Figure 1, indicating significant amount of gravitational contraction. This means that the column density is proportional to , which is nearly scale invariant. Such a distribution could result from shock-compression processes which preserve the column density of the regions compressed. Larson also suggested that observational selection effects may have limited the range of column densities explored (CO density needs to be above a critical threshold to be excited for example). Modern observations, such as those by Lombardi, Alves, & Lada (2010), show that that while column density across a sample of regions and clouds appears to be constant, a constant column density does not described well individual clouds (the probability distribution function for column densities follows a log-normal distribution, which are also predicted by detailed theoretical studies of turbulence). Larson essentially uses relations (1) and (2) to derive a minimum mass and size for molecular clouds by setting the velocity dispersion to be subsonic. Smallest observed clouds have and pc and subsonic internal velocities. These clouds may be protostars. The transition from supersonic to subsonic defines a possible minimum clump mass and size: and pc, which may collapse with high efficiency without fragmentation to produce low mass stars of comparable mass to the initial cloud. Hence the IMF should have a downward turn for masses less than this minimum mass clump. Such a downturn is observed. Simple Jeans collapse fragmentation theory does not identify turnover at this mass scale. Regions that would form massive stars have a hard time collapsing due to the supersonic turbulent velocities. Hence their formation mechanism likely involves accretion/coalescence of clumps. 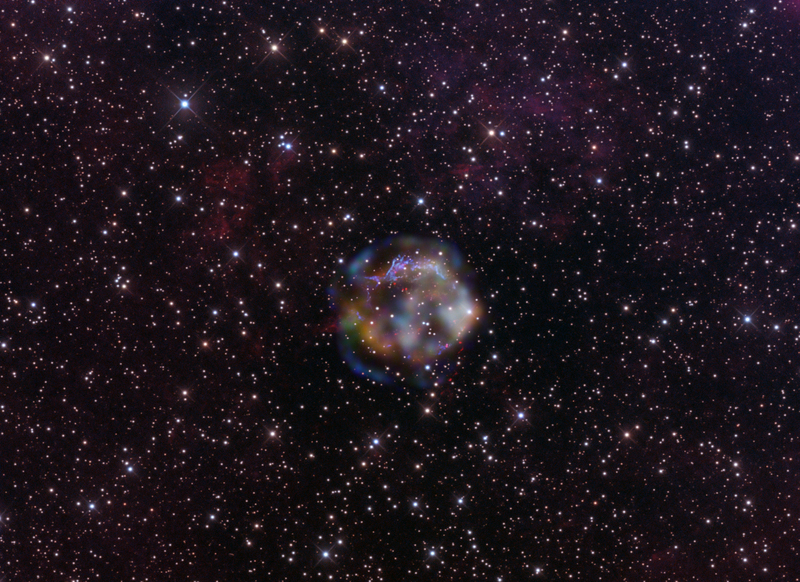 Thus massive stars are predicted to form as members of clusters/associations, as is usually observed. The above two arguments imply that the low-mass slope of the IMF should be deduced from cloud properties, such as temperature and magnitude of turbulent velocities. The high-mass end is more complicated. The associated timescale for the molecular clouds is . It is found to be . Hence the timescales are less 10 Myr for most clouds, meaning that molecular clouds have short lifetimes and are transient. Larson brings to attention the importance of turbulence for understanding the ISM in this seminal paper. His arguments are simple and are supported by data which are clearly incongruous with the previous simplified picture of Jeans collapse in a uniform, thermally-dominated medium. It is amusing and inspiring that Larson could dig through the literature to find all the data that he needed. He was able to synthesize the vast data in a way the observers missed to build a new coherent picture. As most good papers, Larson’s work fundamentally changes our understanding about an important topic but also provokes new questions for future study. What is the exact nature of the turbulence? What drives and/or sustains it? In what regimes does turbulence no longer become important? ISM physics is still an area of active research. Many ISM research to this day has roots that draw back to Larson’s paper. One of the few important things Larson did not explain in this paper is the role of magnetic fields in the ISM, which we know today contributes a significant amount to the ISM’s energy budget and can be a source of additional instabilities, turbulence, and wave speeds. Also, there was not much data available at the time on the dense, subsonic molecular cloud cores in which thermal velocity dispersion dominates and the important physical processes are different, and so Larson only theorizes loosely about their role in star formation. 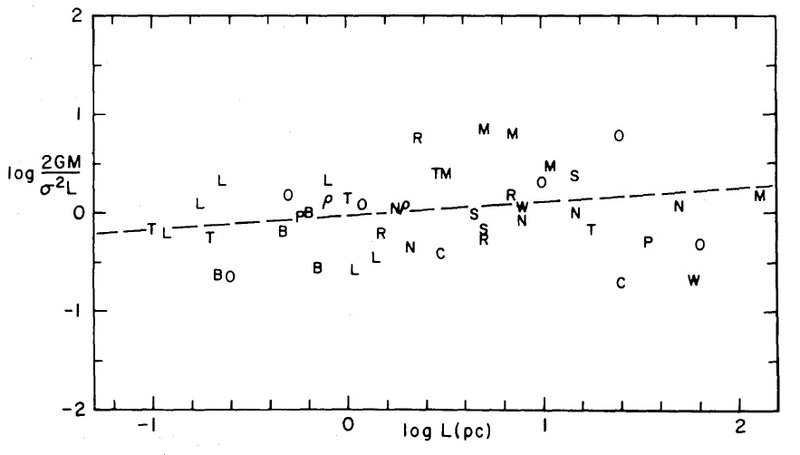 Larson’s estimates for molecular lifetimes (10 Myr) is relatively short compared to galaxy lifetimes and much shorter than what most models at the time estimated. This provoked a lot of debate in the field. Old theories which claim molecular clouds are built up by random collisions and coalescence of smaller clouds predict that Great Molecular Clouds take over 100 Myr to form. Turbulence speeds up this timescale, Larson argues, since turbulent motion is not random but systematic on larger scales. Larson assumed spherical geometry of the molecular cloud regions in this paper to keep things simple. Yet he briefly mentions a way to estimate region geometry. He did not apply this correction to the data and unfortunately does not list the relevant observational parameters ( , ) for the reader to make the calculation. But such a correction would likely have reduced the scatter of the region size and have steepened the vs relation, closer to what we observe today. His argument for geometrical correction, fleshed out in more detail here, goes like this. where the integrals are over to . which is a number Larson quotes. Larson observes this ratio for regions of size less than 10 pc, meaning that the assumption that the are nearly spherical is good. But for larger regions, Larson sees much larger ratios ~1.7. This ratio can be expected for more sheetlike geometries. For example, if the geometry is 10 by 10 wide and 2 deep, one can calculate that the expected ratio is . It would have been interesting to see a plot of as a function of , which Larson does not include, to learn about how geometry changes with length scale. The largest regions have most deviation from spherical geometries, which is perhaps why Larson did not include large ~1000pc regions in his study.